The Design and Implementation of a Log-Structured File System presents a new technique for disk storage management. A log-structured file system writes all modifications to disk sequentially in a log-like structure, thereby speeding up both file writing and crash recovery. The log is the only structure on disk, it contains indexing information so that files can be read back from the log efficiently. In order to maintain large free areas on disk for fast writing, the log is divided into segments and a segment cleaner to compress the live information from heavily fragmented segments. This book presents a series of simulations that demonstrate the efficiency of a simple cleaning policy based on cost and benefit. The author has implemented a prototype log-structured file system called Sprite LFS, it outperforms current Unix file systems by an order of magnitude for small-file writes while matching or exceeding Unix performance for reads and large writes. Even when the overhead for cleaning is included, Sprite LFS can use 70% of the disk bandwidth for writing, whereas Unix file systems typically can use only 5--10%. 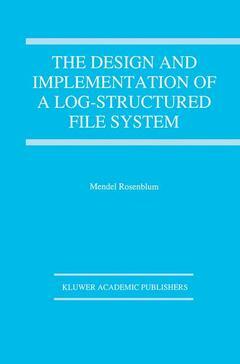 The Design and Implementation of a Log-Structured File System demonstrates how a log-structured file system can be used more efficiently than existing file systems. This new system is well suited to the technology facing the disk storage manager. 1. Introduction. 2. Disk Storage Manager Design. 3. Motivation. 4. Log-Structured File Systems. 5. Sprite LFS Cleaning Policies. 6. Experience with Sprite LFS. 7. Related Work. 8. Conclusion. Index.